We started vine cultivation at 1995. At the time we cultivated considerably derelicted part of the vineyard in former jewish vineyard Viničná hora. We bought mentioned part of the vineyard at 1998 from descendants of native owners. The ground-plot was planted by Müller-Thurgau. At the time we lease part of the vineyard planted by Tramín červený, Svätovavrinecké and Iršaj oliver. In 2000 we planted our first vines. We decided for Rizling vlašský which brought „virgin“ harvest at 2003. In 2003 we took another decision to found a new vineyard at ground-plot called Gečová. 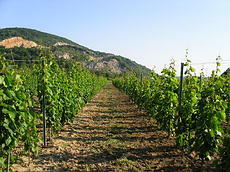 The vineyard was planted by Frankovka modrá, Cabernet sauvignon, Chardonnay and Sauvignon blanc. We had the virgin harvest in 2006 yet. It was the outstanding year and Frankovka a Chardonnay have sugar content 23°NM, Cabernet Sauvignon 19,5°NM. Virgin wines are special ones in our cellary and people appreciate them anyway.